원래는 김해군 상동면 감로리 절터에 있던 것을 조선시대 말에 부근의 강변으로 옮겼으며, 1947년 2월에 법당을 다시 지으면서 현재의 장소로 옮겼다. 대좌(臺座)와 광배(光背)를 갖춘 완전한 불상이다. 당당한 어깨, 양감있는 가슴, 양감있는 팔다리의 표현에는 입체감이 어느 정도 나타나고 있으나 손이나 목 등 세부표현에서는 형식화된 면이 엿보인다. 얼굴은 네모지고 튀어나온 이마로 인해 힘이 있으나 가늘게 뜬 눈, 작은 코와 입 등에서 통일신라 후기의 시대적인 특징을 볼 수 있다. 왼쪽 어깨만 감싸고 있는 옷은 신체에 밀착되어 있고, 옷주름의 표현 역시 간략하게 되었다. 부처의 몸에서 나오는 빛을 형상화한 광배에는 불꽃무늬, 연꽃무늬, 구름무늬 등이 조각되어 있으며, 광배 윗부분에는 작은 부처 1구와 비천상(飛天像)이 새겨져 있다. 특히 광배에 비천상이 새겨진 경우는 매우 드문 예로 해남 대흥사 북미륵암 마애여래좌상(국보 제308호)의 광배와 동일한 형식이다. 불상이 앉아 있는 대좌에는 연꽃무늬와 비천보살상 등이 새겨져 있으며 8각으로 되어 있다. 통일신라 중기의 불상양식을 지니고 있으면서 세부에서는 이상적인 면이 사라지고 형식화되어 가는 통일신라 후기의 작품으로 보인다. 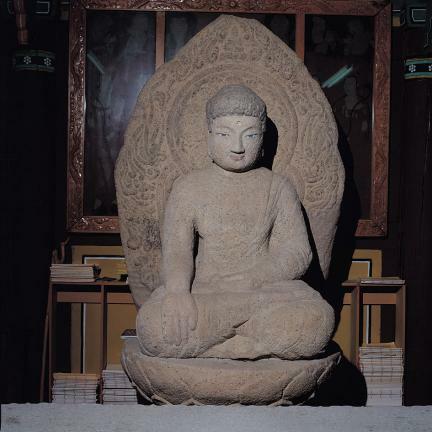 This stone seated Buddha, which remains as a complete form including its pedestal and mandorla (Buddhist halo of light), was originally located in a temple in Gamno-ri, Sangdong-myeon, Gimhae County. 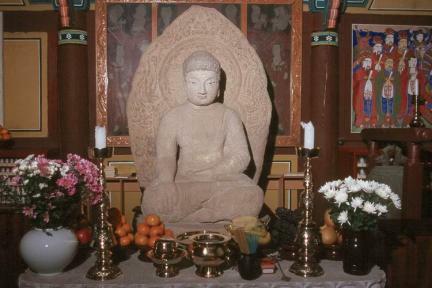 It was moved to a nearby riverside around the end of the Joseon Dynasty, and was then transferred to its present location in February 1947 when the Buddhist sanctuary was rebuilt at Yonghwasa Temple. The robust shoulders, broad chest, arms and legs are expressed with a sense of volume and exhibit a three-dimensional sense, but the hands, neck and other details are presented in a more formal fashion. 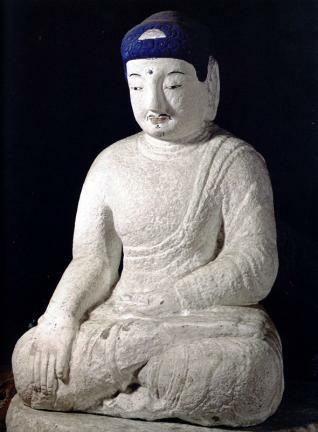 The square face looks powerful with its protruding forehead, but the narrowly-open eyes, small nose and mouth are all typical features of the late Unified Silla era statue style. 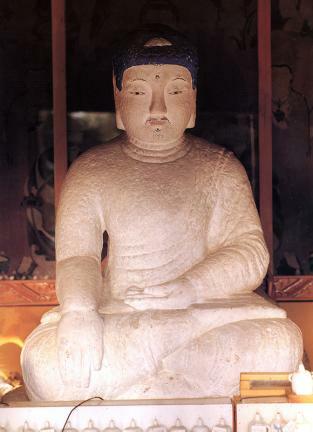 The robe covering the left shoulder but leaving the right shoulder exposed is tight on the body with simple folds. 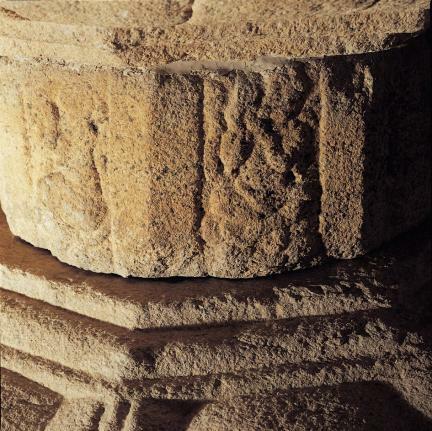 The mandorla, which depicts the light emanating from the Buddha’s body, is engraved with patterns of sparks, lotus flowers and clouds. 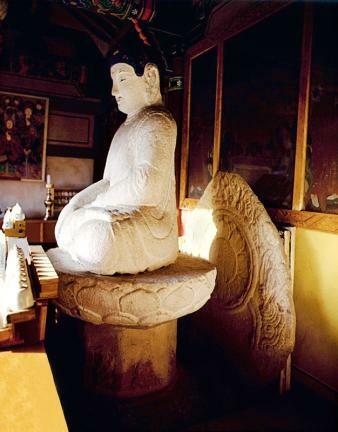 The top of the mandorla is carved with a small Buddha and a figure of a flying maid, a very rare example of an image which can also be found on the mandorla of the Rock-carved Seated Buddha at Bungmireugam Hermitage of Daeheungsa Temple, Haenam (National Treasure No. 308). 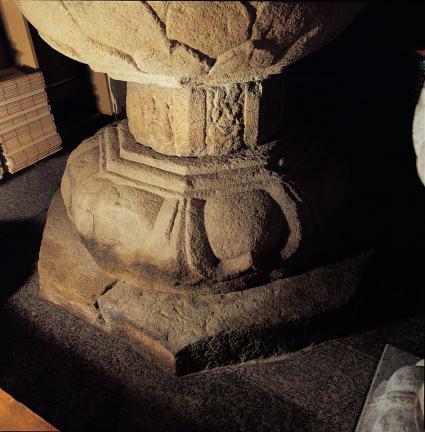 The octagonal pedestal on which the statue is sitting is engraved with lotus flower patterns and flying Bodhisattva images. 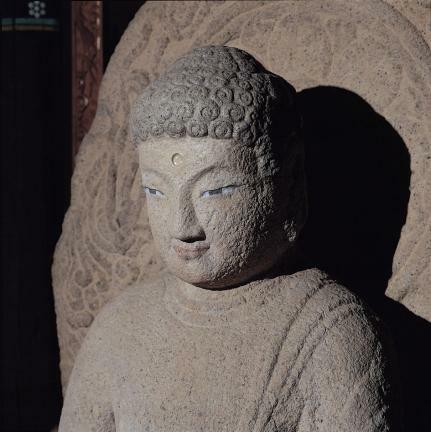 This stone seated Buddha shows characteristics of statues from the mid-Unified Silla period, but as its details of are expressed in a more formal way than in the statues of that time, it is assumed that it was made during late Unified Silla.